H R Shah, TV Asia chairman and CEO, center right, with Shymal Modi and Piraan Erachshaw of 1947 Productions, second and third from far left, with other guests and sponsors at the Ganesh Utsav in Woodbridge, NJ. Ganesh Utsav was celebrated over 5 days, starting Sept. 13 at the Woodbridge Center Mall in Woodbridge, NJ. Hosted by 1947 Productions and Entertainment, the festival celebrated Ganesh Chaturthi, with daily aarti attended by thousands of devotees. On display was a 14-foot Ganesha statue, placed on a stand inside a tent, that was open to visitors. Also on display was a 1200-pound modhak. On the day of Ganesh Visarjan, the last day of the festival, a 2-foot idol was submerged in a bucket of water in place of the 14-foot statue. 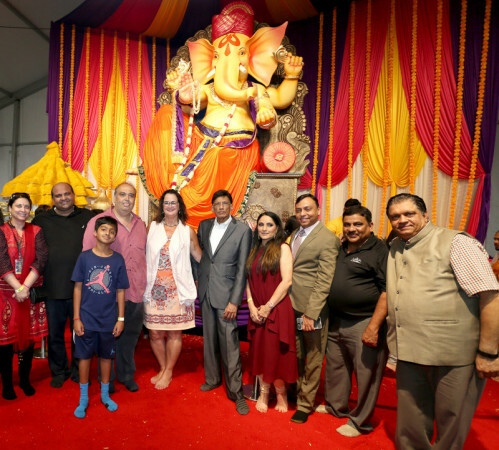 “1947 brought the replica of the world famous Ganesha to Woodbridge (New Jersey) and making it one of the grandest of celebrations of the festival in the United States,” stated the organizers.